Saolta University Health Care Group Board member Phyllis MacNamara recently hosted an afternoon tea style event to benefit the arts programme at Galway University Hospitals. With over a hundred guests in attendance to support the event, host Phyllis MacNamara said, “I would like to thank everyone who helped make this event a success. From our fantastic guests to our wonderful supporters and sponsors. Thank you all for supporting the arts programme in Galway University Hospitals and I hope everyone learned about how important the arts programme is to the hospital community”. 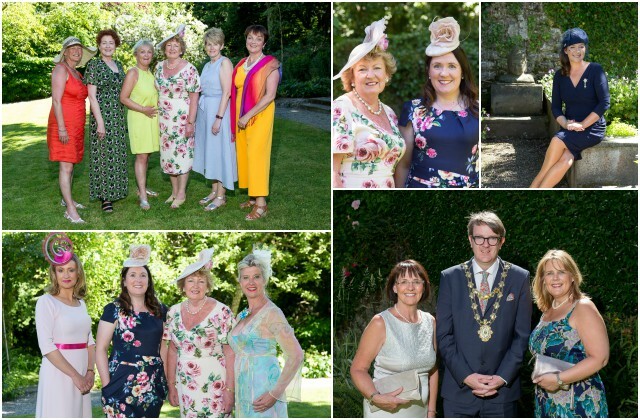 As the sun shone in a garden in full bloom, guests mingled and sampled the delicious consortium of afternoon tea delights including gourmet sandwiches and delicate desserts along with a choice of homemade lemonade or prosecco and were enterained throughtout the afternoon by renowned singer and piano man, Seán De Burca. Mary Surlis from Clarenbridge took the title of most elegant lady and was presented with a bespoke, an original design sponsored by Emily-Jean, Milliner and Jewellery Designer. Galway University Hospitals Arts Trust was established in 2007 to provide an arts programme for the hospital community. The organisation runs the west of Ireland's leading Arts and Health programme as a means of improving the hospital experience for patients, staff and visitors. Galway University Hospitals Arts Trust believes access to the arts promotes well-being and enhances the hospital environment, providing a multi-disciplinary programme of events and activities, including exhibitions, participative workshops, music, theatre and poetry. To learn more about the arts programme, contact the arts office in Galway University Hospitals, call 091-544979 or email guhartstrust@hse.ie with an inquiry.